I am a staff scientist at the Infrared Processing and Analysis Center (IPAC), on the campus of the California Institute of Technology (Caltech). As a member of the IRAC (Infra-Red Array Camera) instrument team, I help to manage the operations and data reduction of science data taken on the telescope. My astronomical research deals with brown dwarfs, substellar companions, extra-solar planets, and adolescent stars. 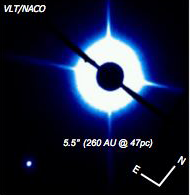 I have concentrated recently on learning more about differences in spectral features as young, low-mass dwarfs. 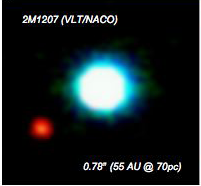 AB Dor B is a ~13 Mjup companion to AB Dor A.
on the VLT AO system.